In order to form correct English sentences, you must know how to use articles and nouns properly. 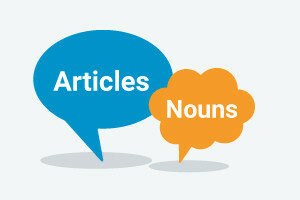 This English grammar course will teach you about the different forms of nouns as well as the correct articles that go with them. This will make your English conversations, reading and writing skills much stronger, and will help you sound a lot more fluent. These are strong rewards for just a few hours work, so check out the course today! This course will first introduce you to countable and uncountable nouns. Countable nouns refer to something that can be counted such as 'key' and have both singular and plural forms. You will learn that the article 'a' or 'an' precedes their singular form such as 'a key'. Uncountable nouns are not typically counted and usually do not have a plural form, although there are exceptions. You will learn that uncountable nouns are not preceded by 'a' or 'an'. You will then learn how to use 'few' and 'many' with plural countable nouns as well as 'little' and 'much' with uncountable nouns. As you go further, you will study the rules on using the articles 'a' and 'an', which you will find easy as long as you know your English vowels and consonants. The course will also teach you how to use the article 'a' to specify how much and how often, as well as the rules for the article 'the'. The grammar rules on articles and nouns are some of the easiest but most important to learn in the English language, which is why you will find the lessons in this course really rewarding. This intermediate level grammar course is also designed to improve your English reading comprehension and listening skills, and to make your learning journey really enjoyable. So, have a look at the course today, and improve your English skills a little bit more! Define countable and uncountable nouns and justify why we can't use numbers with uncountable nouns. Explain how countable nouns can be singular or plural and why uncountable nouns have only one form. Decribe why we use articles with singular countable nouns but not usually with uncountable nouns. List examples of using some, any, few and many with plural countable nouns and uncountable nouns. Summarize how some nouns can be used as countable and uncountable.